Having only recently discovered the extent of Croak’s presence on the net, my head is still spinning somewhat (and is appreciably larger too). Here’s a description and some reviews of Croak! over at Lemon Amiga. Here’s Croak! listed at the Hall of Light. Here’s the listing for Croak 2. Here’s Croak 2 at Aminet. I’m flattered that somebody called Syndicate has actually created a clone of Croak! using Flash. It’s not exactly the same, but you can play it online right now (it’s everywhere). The graphics and sounds are mine, but for some reason the turtles are from Frogger and the frog has shrunk. The title screen music demonstrates quite effectively why the original Croak! didn’t have any. See this thread where bippym has managed to fix the speed and invisible frog issues when running on a real Amiga, using something called WHDLOAD. Firstly I would like to express my extreme gratitude to all those over at the Amiga Magazine Rack. Until a week ago I knew that Croak! had been featured in six magazines. I had no idea that the count was almost double that! Amiga Format 35 - can you spot Croak? The October 1994 editions of Amiga Format and The One Amiga both mentioned Croak in their reviews of the Golden Oldies 2 PD compilation, the latter describing it as a “superb Frogger clone”. In January 1994 it was gushingly reviewed by Australian Commodore and Amiga Review, Vol 11 No 1. “Apart from the fact that it’s flawlessly programmed, the best thing about Croak is the simultaneous two-player mode, that transforms the game into a vicious contest for homes and bonuses.” Their effusive praise might have something to do with the fact they were trying to flog it on a disk for five bucks. In June 1994 it was included on the coverdisk of a French magazine Amiga Dream Issue 8. There are no scans available but it was on page 7. In October 1994, Amiga CD32 Gamer, Issue 5 (page 6) said “Everyone loves a good Frogger clone!”. They included Croak! on their CD. A shame that it runs at twice normal speed on a CD32! Croak 2 got its day in the sun in April 1997 when it was included on a coverdisk (The Great AUI Games Disk No. 1) attached to Amiga User International Vol 11 No 4 (page 10). On this occasion I was sent a note of congratulations and a copy of the magazine! 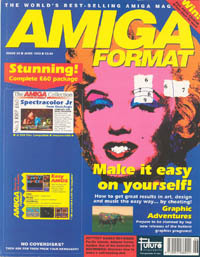 And finally, Croak 2 was included on the coverdisk for Amiga Format, Issue 127 (page 82). The article’s author might have licked one-too-many cane toads though, because he mentions snakes, alligators and otters, none of which are in the game! Leaving the 20th century behind, I was delighted to find Croak! on YouTube. The emulator is obviously running way too fast, but who cares! When Croak! starts, the subliminal message “Kate Bush is God – she really is!” can sometimes be seen briefly at the top of the screen. I have since come to accept that this statement probably isn’t wholly true. To croak, of course, is to die. Add an exclamation point and it becomes a command. Quite a violent title, really. When you die, you leave a persistent blood stain on the road that later frogs can slip on. There are no less than ten different blood splatter images. Croak was written in C on a 2MB Amiga 1000 with Phoenix replacement motherboard and 52MB Quantum Fireball hard disk. The chicken and crow impersonations were made by me with a microphone and a digitizer. I can’t remember where I stole the croaking sound from. The blood in Croak 2 is smearable. With a little effort, you can cover the whole road in blood. For a family game, I probably should have made the blood green. There is a chicken on the other side of the road because a snake would be too wide to fit into a single sprite. It also makes a lot of sense to have a chicken on the other side of the road. The original game runs flat-out which is why it is too fast on Amigas with a clock speed greater than 7.14MHz. It doesn’t use double-buffering, so it flickers a fair bit. Croak 2 works out how far to move each row of cars or logs based on how much time has passed since the last move, so it runs at the same speed on all Amigas and smoother on faster ones. Flicker is almost eliminated by waiting until the raster beam has moved beyond each row before moving it. These are the effects of the various butterflies in Croak 2. Persistent effects last until the next butterfly is caught or disappears off the bottom of the screen.